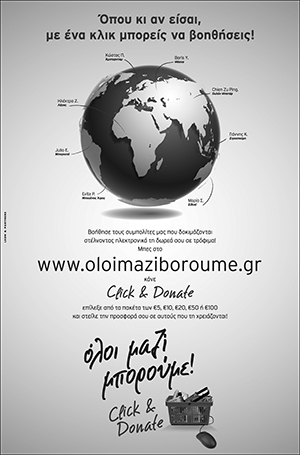 In the ad, Giannis invites people to visit Greece year-round, Kountoura said. “I wish him continuing success and health, and I thank him for joining me in this national effort to raise tourism and Greece even higher,” she added. “I’m Giannis Antetokounmpo. Visit my beautiful country, Greece,” the NBA All-Star beams, standing before a row of classical Greek columns in Greece’s latest push to attract tourists. In the ensuing 60-second clip, footage of Antetokounmpo on the court alternates between postcard images of Greece: turquoise waters, whitewashed chapels and ancient monuments. The video posted by Antetokounmpo on his Instagram page had clocked up more than 65,000 views within a couple of hours. The video will also be promoted by Greek embassies abroad, the Greek National Tourism Organization’s offices in other countries and the media. 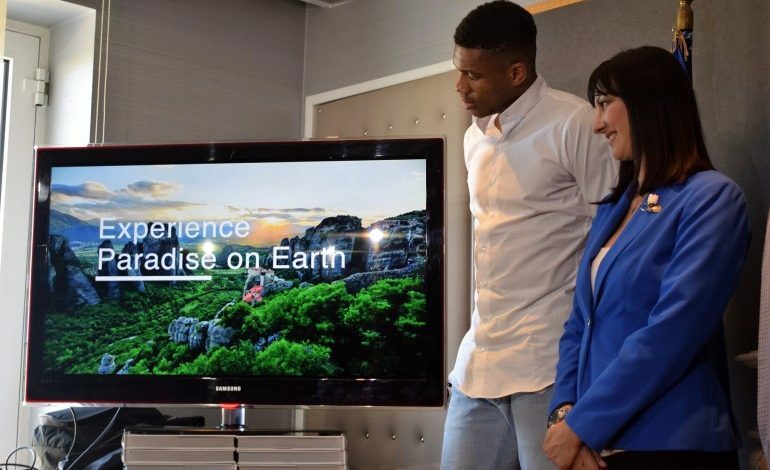 Giannis Antetokounmpo has also joined forces with Greek carrier AEGEAN and since last year has launched the “Greece by Greeks” campaign, as well as the online travel platform, www.greecebygreeks.gr. The Milwaukee Bucks forward said that “the most important part of our Greek culture is solidarity and philanthropy,” and to this end he and his brothers are organizing a run to benefit the charity Kivotos tou Kosmou on July 7, from the Sepolia neighborhood to the Panathenaic Stadium (Kallimarmaro). A giant mural of Giannis in his Milwaukee Bucks jersey covers the court where the Antetokounmpo brothers practiced features in their old neighbourhood of Sepolia. Asked to name his favorite place to visit in Greece, it was, surprisingly, not one of its countless sun-soaked islands. The “Filathlitikos” club of Zographou was the first team Antetokounmpo played for. He said on Friday it is the one Greek club he would ever consider joining. Born in Greece to Nigerian parents, Antetokounmpo and his brothers sold trinkets on the street to survive and grew up fearing deportation. Antetokounmpo was not granted Greek citizenship until 2013, aged 19. Antetokounmpo’s phenomenal rise from a lanky boy in Athens to the NBA has earned him the nickname “Greek Freak” by fans worldwide and comparisons to basketball giants Magic Johnson and LeBron James. Greece is expecting a record 32 million tourists this year and is banking on the sector to help it emerge from nearly a decade of economic crisis and misery.